With regional elections only a month away and the rightwing anti-immigrant AfD now just as big as the ruling SPD party in the polls, the German government of Chancellor Ms Angela Merkel is stepping up its efforts to be seen fighting both the illegal benefits claimants by the immigrant population and the crime wave that has hit certain cities. 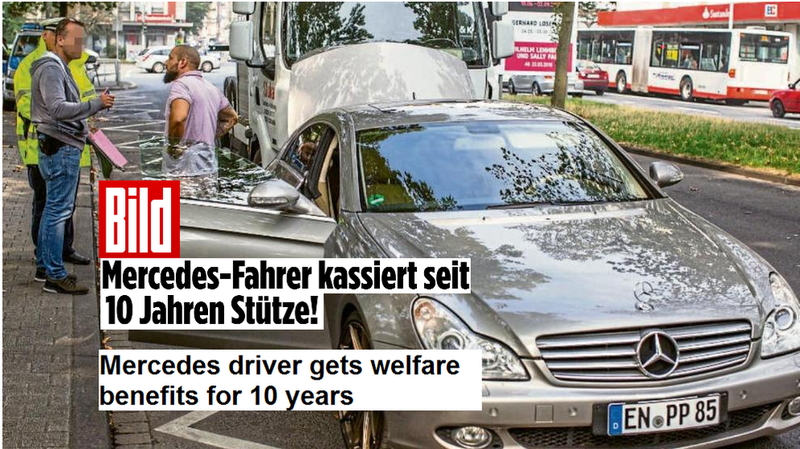 Yesterday it started its effort in the western German city of Duisburg where, to great press fanfare, seven luxury automobiles (mostly Mercedes-Benz) were impounded and three people arrested on suspicion of welfare fraud. Police had setup a random spot check on a major road leading to the unemployment agency in the city center where claimants of welfare could pick up their checks in the neighborhood of Homberg, which is known for a high crime rate. Related coverage: <a href="https://thegoldwater.com/news/36068-Germany-Flensburg-Court-Doubts-Age-Of-Afghan-Who-Stabbed-German-Teen"> Germany - Flensburg Court Doubts Age Of Afghan Who Stabbed German Teen</a>. Duisburg police had announced beforehand: "Officers will take a closer look at the cars to determine whether the drivers were receiving benefits illegally and if so, criminal charges will be filed." Three were arrested for possible welfare fraud and document falsification. Just last week, the police said they would start unraveling the known criminal activities of 70 "families" of Kurdish, Turkish an Arab origin that make up the bulk of organized crime in the city. Ever since then, the German courts have filed charges against some 880 gang members. It is estimated that 2,000 immigrant gang members currently reside in Duisburg. For years, the German public has viewed northern Duisburg as an area of migrants, violence, and crime. Local Germans consider the streets around Hamborn, Hochfeld, and Marxloh as a "no-go-area." In the district of Marxloh, some 60 percent of the population does not have German citizenship according to municipal registrations. Police estimate the true figure to be higher as many are probably living there illegally. The US needs to start doing the same. The people that abuse welfare should have it revoked permanently. There are rapegees in Deerborn MI driving $80k + cars and living in 1/2 million dollar homes but us taxpayers are footing the bill for their groceries.